Our Kunekune pigs are registered Jenny line (females) and Andrew line (males). Piglets are $1200 each, with a $100 deposit due when you reserve your piglet. Please email us at murphy-erin@comcast.net or call 530-559-1602 to reserve your piglet. All piglets are sold! Please contact us if you are interested in Kunekune piglets, as we will have more in the future. We are hoping for a litter in fall 2018. Male, white and black, 2 wattles, $1200, “Abba-Zaba“- SOLD! Male, black and white, 2 wattles,$1200, “Twizzler” – SOLD! Male, black and white, 2 wattles, $1200, “Starburst” – SOLD! Female, ginger and black, 2 wattles, $1200, “Skittles” – SOLD! Female, ginger and black, no wattles, $1200, “Tootsie” – SOLD! The sow is Maybelline, a black-and-white Kunekune from the USA Herd. 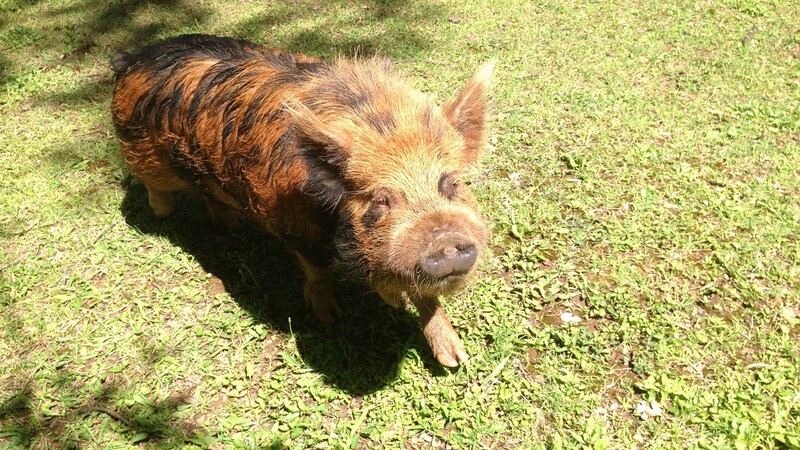 The boar is Pavarotti, a ginger-and-black Kunekune from Diamond Wire Farms in Placerville, CA. Female, 2 wattles, black and white, $1200 – SOLD! Female, 2 wattles, ginger and black – Congratulations Anita of Durham, CA! Male, 2 wattles, ginger and black – Congratulations Tammy of Roseville, CA! Piglets are registered Jenny line (females) or Andrew line (males). To learn about our breeding pair, please visit Meet Our Pigs. Hi Devin, the piglets are $1200 each. Please reply with our next step!